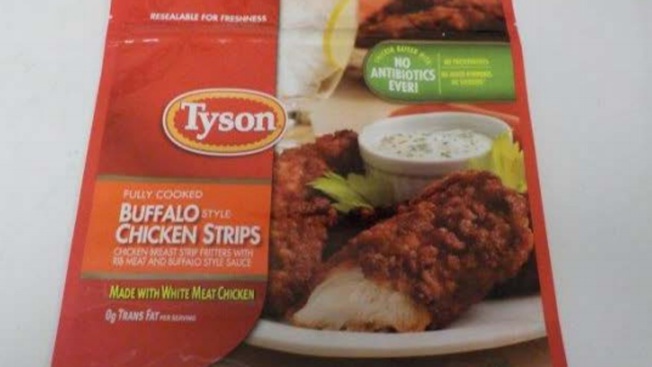 Tyson Foods has recalled more than 69,000 pounds of ready-to-eat chicken strip products that may be contaminated with extraneous materials, the U.S. Department of Agriculture's Food Safety and Inspection Service announced Thursday. The recalled products are three different kinds of fully cooked, frozen chicken strips: 25-oz. packages and 20-lb. cases of "buffalo style" chicken strips, along with 25-oz. packages of crispy chicken strips. They were shipped to stores nationwide and for "institutional use" in Michigan and Washington. There have been no confirmed reports of anyone getting sick after they ate the products, but the USDA said consumers should throw the products away or return them. The back of the packages are labeled with the code "P-7221" and are marked with a "best by" date of Nov. 30, 2019. See the label here. The problem was discovered after the USDA received two complaints. Anyone with questions about the recall can call Tyson at 1-866-886-8456.